Open cluster Messier 6 (M6, NGC 6405) is described by Burnham as a "charming group whose arrangement suggests the outline of a butterfly with open wings." Burnham proposes that Ptolemy's mentioning of its apparent neighbor, M7, may include M6; however, this proposition is speculative and improbable. The next, and first certain reported observer was Giovanni Batista Hodierna who has seen it before 1654; but Hodierna's records did not become generally known before the 1980s. Thus, Philippe Loys de Chéseaux independently rediscovered it in 1745-46, and was the first to recognize it as "a very fine star cluster." 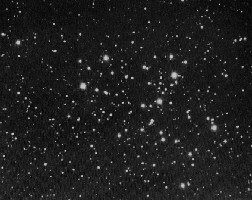 Abbe Lacaille included it in his catalog of 1751-52 as Lac III.12, and Charles Messier eventually cataloged it on May 23, 1764. Ake Wallenquist, in 1959, has identified about 80 cluster members in M6, spread over a region about 54 arcmin in diameter. The main portion of the cluster fills a field of about 25' angular diameter. The distance of M6 was estimated by Rohlfs et.al. at about 2000 light-years, a value also given by Mallas/Kreimer and in the Sky Catalogue 2000.0, but Burnham reports that newer studies have shown that due to absorption effects, the true distance may be smaller, and cites values of 1300 to 1470 light-years; Kenneth Glyn Jones has 1304. More modern values are given by Archinal/Hynes and WEBDA as 1,584 and 1,588 light-years, respectively; we adopt an approximate value of 1,600 light-years here. 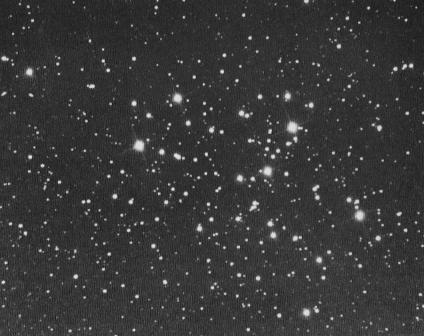 Given this distance, the apparent diameter of this star cluster of 25' corresponds to a linear extension of some 12 light-years, with extensions covering a space of about 25 light-years (Wallenquist's 54'). The average density has been estiamted at 0.6 star per cubic parsec. M6's age has been estimated at 100 million years according to Burnham, 51 million years according to the Sky Catalogue 2000.0, and 95 million years according to WEBDA. Modern sources agree about the total visual brightness of M6 at about 4.2 magnitudes, while older estimates, done by northern observers, had it notably fainter at about 5.3 mag. The brightest star in this cluster is the variable star BM Scorpii = HD 160371, a yellow or orange supergiant (spectral type K0-K3 Ib), a semiregular veriable of type SRd, with its apparent magnitude varying between mag 5.5 and 7. Its variability makes the total magnitude of the cluster notably varying. This star is the most left of the 4 bright stars forming the remarkable quadrangle of approximate parallelogram shape in our photo. The hottest stars are blue main sequence stars of spectral type B4-B5. Burnham lists the brightest stars of M6 as follows: 1. mag 6.17, spectral type K0-K3 (this is BM Sco); 2. mag 6.76, B8; 3. mag 7.18, B5; 4. mag 7.26, B4; 5. mag 7.27, B8; 6. mag 7.88, B9. The contrast between the orange giant and the bright blue stars is obvious in color photos of the cluster, see e.g. the NOAO color image of M6. Trumpler has classified M6 as II,3,m, while the Sky Catalogue 2000.0 gives its Trumpler type as III,2,p, Götz and Archinal/Hynes as II,3,r. Of all Messier objects, M6 is situated at the closest angular distance from the Galactic Center, which is located in the constellation Sagittarius but very near to the 3-constellation edge of Sagittarius, Scorpius and Ophiuchus.